FILIPINO workers in BSB, Brunei. 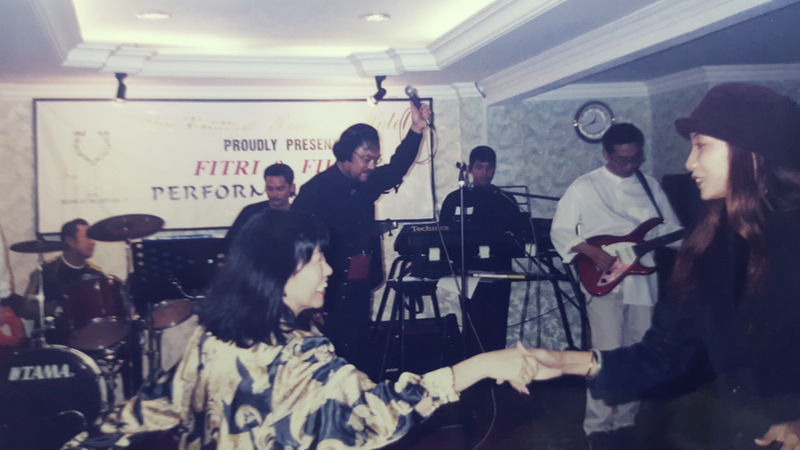 A Saturday night scene in 2000 at Crowne Princess Hotel in Bandar Seri Begawan showing the author (centre) doing a rock and roll number. ‘PENGIRAN’ (left) and ‘Datin’ attending one of my shows at Crowne Princess Hotel. TWO hotel workers. At left is a Singaporean while the other is a Bisaya from Limbang, Sarawak. SABAHANS in BSB. They were part of our show in Crowne. 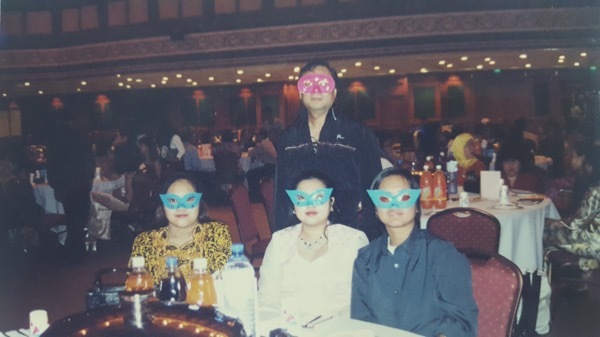 THE author posing for a photo with three ladies during a 2001 function at International Convention Centre (ICC) in the Brunei capital. 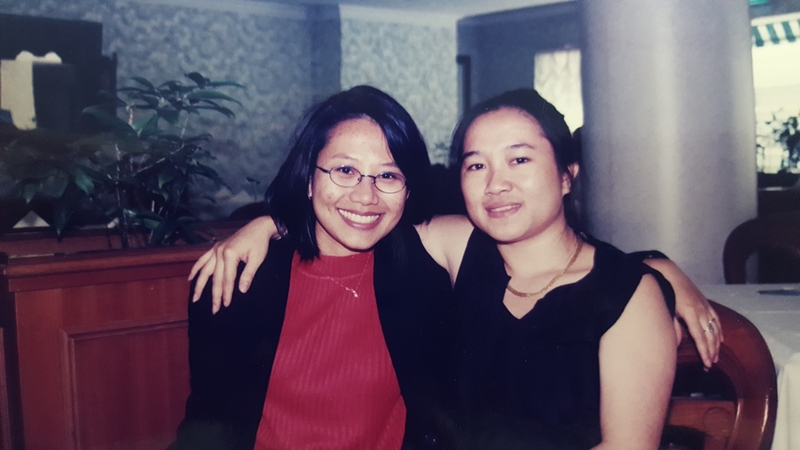 WHILE having a weekend retreat from Bandar Seri Begawan (BSB), the Brunei capital to Sarawak’s border town Limbang in mid 2000, a friend and I dropped by at a music joint to unwind for the evening.“A bottle or two will be just fine pare (friend),” said Tony, my Filipino colleague who came with me in my 22-year-old Nissan Skyline from our Kianggeh flat in BSB for a night stay in one of Limbang’s budget hotels. Upon our arrival at the noisy but posh pub and karaoke joint, two ladies in their thirties boldly raised their hands and called in Brunei Malay, “Elvis, please come and join us,” motioning me and Tony to sit at the counter next to them. Before obliging I had to take a closer look because they looked like strangers to me. So upon scrutiny, I discovered that the better looking lady was a regular patron at my Saturday night show at BSB’s Crowne Princess Hotel, owned by Princess Rokiyah, the younger sister of Sultan Hassanal Bolkiah. She was a Pengiran – an aristocratic title in Brunei – actually but minus her usual ‘tudung’ (head scarf), I hardly recognised her. Her female friend, a Datin who was estranged from her Dato husband was also without her tudung. So without the head gear, they could pass for anybody. “Don’t worry Elvis, this night belongs to the four of us; we will ‘belanja’ (sponsor) the drink and food,” said the Pengiran whom I was introduced months earlier in BSB during her first appearance at my show as an eligible spinster. When I pretended to be reluctant, the Pengiran said they were unaccompanied and it would be good for me and Tony to accompany them to make them feel safer. So we took our seats next to them at the pub’s counter and ordered wine, according to the Datin’s choice. It was a red port wine from Australia which the Pengiran happily paid. In fact two more bottles of the red wine came by after lots of barbequed chicken wings were ordered by Datin. In fact the evening trully belonged to us as we enjoyed singing, eating and drinking oblivious to other patrons in the music joint. 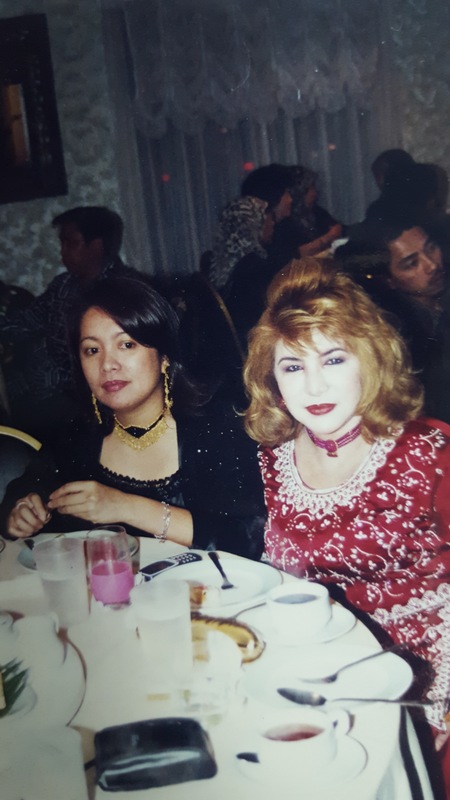 This chance encounter tells a lot about the true reality of the Brunei mindset, somehow well hidden from the public eyes at that material time, namely about 20 years ago – I cannot say for now, because it may have probably changed in a way or two. One gets to know some of these only by getting close to the people or subjects concerned. Don’t be stunned if they change drastically just to fit into a situation; even to the extent of putting on some kind of a necessary camourflage. As a journalist and entertainer I was privileged in a number of ways and thus presented with opportunities to go a bit further than most people in my networking and friendship. My appearance and weekly (Saturday night) engagement at the Crowne Princess Hotel restaurant in BSB between 1999 and 2001, for example, was a great stage in getting to know a lot of people, especially music enthusiasts in the Brunei capital, hotel clients and others. It was also a great meeting point for Malaysians, especially Sarawakians and Singaporeans thanks to its many Sarawakian workers and female public relation chief who was a Singaporean. It gave me the opportunity to know the owner, Princess Rokiyah who knew not my real name, but just called me ‘Elvis’ – when she invited me to her birthday in Palace De Chateau, BSB, I was addressed as ‘Elvis’ in the invitation card; even the envelope containing a considerable amount of BND dollars – more than my monthly pay as Borneo Bulletin senior sub-editor – as a token for my brief EP show in the palace was addressed to ‘Brunei Elvis buah tangan dari Puteri R’. Another member of the ‘royal’/aristocratic circle who was a regular patron at the Crowne Princess Hotel restaurant was Pehin Dato Abbas bin Datu Harun who was Advisor to Seri Begawan Sultan Omar Ali Saifuddien II, the late father of Sultan Hassanal Bolkiah. Abbas younger brother Pehin Dato Isa during my time there was the Advisor to Sultan Hassanal Bolkiah. Their father Datu Harun was the first Chief Minister of Brunei. Abbas, then 71, was a regular face in my show because of his love for music, especially Elvis’. He was a good keyboardist and owned several keyboards and organs at his palatial home in Beribi just about a kilometre from the Istana Nurun Iman, the monarch’s palace. He brought me to his residence one early Sunday morning – just minutes after a Saturday night show in the hotel; partly also to introduce to me his lovely daughter, 35, a spinster. “What name would you choose upon conversion to Islam?” he asked me over coffee prepared by the pretty lady. I was not caught by surprise as this was not the first time he asked me the same question within two hours, since having a light-hearted conversation over Johnnie Walker (black label) in the hotel earlier. “Pehin Abdul Tawi would be preferable,” I replied and we both laughed. My Filipino colleague Antonio Alabastro @ Tony who accompanied me to the magnificent home of Abbas also totally agreed – there were times later at our shared flat when he addressed me as ‘Pehin Tawi’ in jest. Bruneians, generally, are a shy bunch. At first sight their women and girls, especially men, look aloof, arrogant, and even to the extent of being boisterous. However, as you get closer to them, you would find that generally they are friendly, while some might become nervous and feeling vulnerable when meeting strangers, especially Sarawakians from outside Miri and Limbang. 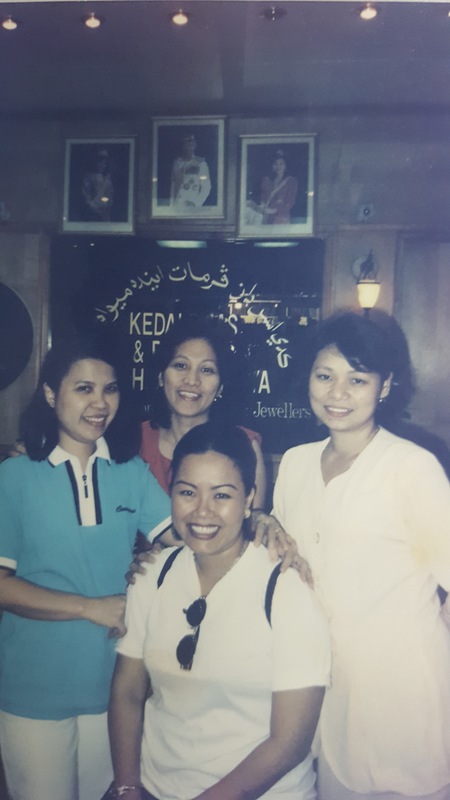 My seven years of close association and scrutiny is good enough to make this assumption – I was privileged to know Prince Abdul Qawi, the son of Perdana Wazir Prince Mohamed Bolkiah, then the Foreign Affairs Minister. Qawi was also our Brunei Press Deputy Chairman; his mother was our Chairman. Princess Rokiyah seemed to have that kind of confidence though I sensed she was also nervous when facing us journalists, a similar weakness shared by then Sultan’s wife number two Pengiran Isteri Mariam. During an afternoon show to entertain the Girl Guides Association members at her palace Istana Nurul Izzah – my only encounter with her – Mariam certainly looked a bit nervous and perturbed for unknown reasons. Among others, I managed to go along well with Haji Saedon, a retired Shell Brunei employee and Pengiran Suhaimi who was then Brunei Youth chief and good friend of Anwar Ibrahim (now Datuk Seri Anwar and PKR president-elect) when the latter was ABIM (Angkatan Belia Islam Malaysia) chief. Suhaimi was a teacher who went for training in then Sultan Idris Training College (now UPSI) at Tanjung Malim, Perak. His was married to a Malaysian. Haji Saedon, who operated Purih Baik (Good Breed) premises at Kianggeh near to my rented apartment there, also engaged me to perform there on Fridays at least twice monthly. Purih Baik premises comprised food stalls, dining tables, exhibition and game booths as well as entertainment stage spread over a large compound. He and company are my regular Johnnie Walker (red label) patrons – one 1 litre bottle bought in Limbang then cost me RM29 but sold to Saedon, Suhaimi and group at BND 50@ bottle which was more than triple its RM29 price. And yet, he asked me to be the first to open and sample the whisky and later to take back any balance, which I never did. My favourite food at the Purih Baik stalls was ‘Satay Indonesia’, prepared by Indonesian workers in the sultanate with their special gravy but paled in comparison with the famed Kuala Lumpur’s Kajang Satay gravy. I will always cherish the memories with Saedon and Suhaimi. Our day trip using a boat to Limbang from BSB and back helped seal our comradeship. Ours is a story of friendship without margin, transcending racial and cultural borders. Those opportunities of knowing these Bruneians were rare and I consider myself lucky they came my way during my short stay there. As such I am forever grateful. Forever grateful for such rare opportunities 0 out of 5 based on 0 ratings. 0 user reviews.